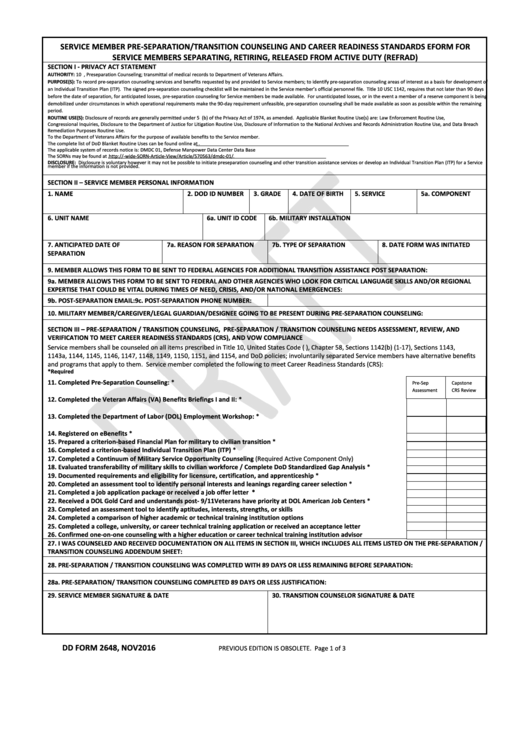 Download a blank fillable Dd Form 2648 - Service Member Pre-Separation/transition Counseling And Career Readiness Standards Eform For Service Members Separating, Retiring, Released From Active Duty (Refrad) in PDF format just by clicking the "DOWNLOAD PDF" button. Complete Dd Form 2648 - Service Member Pre-Separation/transition Counseling And Career Readiness Standards Eform For Service Members Separating, Retiring, Released From Active Duty (Refrad) with your personal data - all interactive fields are highlighted in places where you should type, access drop-down lists or select multiple-choice options. AUTHORITY: 10 U.S.C. 1142, Preseparation Counseling; transmittal of medical records to Department of Veterans Affairs. To the Department of Veterans Affairs for the purpose of available benefits to the Service member. member if the information is not provided.